SERVICES - JIM WROBLESKI & CO., INC.
We Are “Specialists” In The Type Of Lines We Represent. We have traditionally concentrated on representing manufacturers from the high performance and custom accessory product areas. We do not represent the traditional “hard parts” product lines; consequently we can cover a much larger area with fewer sales people because of our specialization. This specialization allows us a greater insight and knowledge of the products we handle as well as our competition. We call on and sell the warehouse distributors, no matter what size or product mix. We also actively call on hundreds of jobber accounts to funnel business to existing W. D.’s. We call on and sell the chain stores that have their headquarters in our area. We call on and sell the tire distributors in our area. We call on and sell the major mail order and internet accounts. 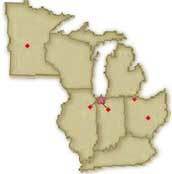 Our many years of selling in this geographic region have given us the knowledge of who to sell and who not to sell. If they can and should buy the line and its products, we can sell them - in most cases, we probably sell them something already.